1. The Show-Me-How School Initiative is still looking for A FEW GOOD SCHOOLS. Please leave a comment on this post, telling which school or other child-care facility you would like to nominate to receive a free copy of Show Me How! 2. Heather Newman, fellow 12x12er and PPBF participant, did a lovely review of my book on her blog. If you haven’t read it yet, just click on this link. My sincere thanks to her for the wonderful things she said…and also for posting the review on Amazon. I’m really grateful to her for adding the review to the Show Me How Amazon site because I’ve recently read that getting reviews on Amazon is very good for a book that is being sold there. I believe I read that 25 or more reviews really help book sales. Over the last two years, several dozen people have reviewed the book…but I never thought to ask them to post the review on Amazon…if anyone did review the book and would like to add that review to Amazon, I would be most appreciative. If anyone would like to review the book, let me know and I will be happy to send you a copy. Morning, noon and through the night. Although Digby, a little otter, has fun during his first day of school, he is reluctant to go again. He tells his mother that there are so many things to remember (where to hang his coat, how to line up, etc.) and he is afraid he will forget some of them and be embarrassed. Digby’s mother solves the problem by filling her hands with kisses and putting the kisses in her son’s jacket pocket. During the day, whenever Digby feels uncomfortable or scared, he takes out one of the kisses and presses it to his cheek. Helping another student who is even more hesitant than he is enables Digby to forget his own fears…and Digby finds he is looking forward to the next school day. Many of us are anxious about having new experiences, going to new places and meeting new people. 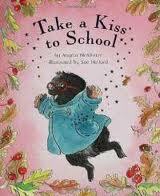 This is a lovely story that will comfort many young children who are anxious about school. Coping with and overcoming separation anxiety is a big step in a child’s emotional development and parents need to be sensitive and non-judgmental about a child’s fears. The illustrations convey little Digby’s feelings and will help young listeners relate their real life experiences to his…creating a perfect opportunity for the young listener to voice his own fears. For many children, the first weeks of school may be difficult because they don’t like eating “different” foods. Here is a fun craft activity that might help. You will need: Construction paper, markers or crayons, old magazines with pictures of food, scissors, glue, string or yarn and a wire hanger. 1. Talk about the different food groups and why we need to eat some from each group every day. 2. Look through the magazine and cut out pictures of foods. 3. Paste each picture onto construction paper and cut out. 4. Punch a hole at the top of each picture and tie a piece of string through the hole. 5. Attach the end of the string to the wire hanger. 6. Repeat for several pictures. 7. Hang up and watch the foods wave in the breeze. In the story, Digby’s mom puts kisses in his jacket pocket. You and your child can make a lovely picnic lunch using Pita Pockets. Fill with your choice of chicken or tuna salad…or perhaps the always popular peanut butter and jelly. Inviting your child to help prepare meals in the kitchen is a wonderful way to encourage a fussy eater to try new items. This entry was posted in book reviews, children's picture books, Perfect Picture Book Friday, school anxieties, self-esteem, Show Me How! School Initiative and tagged Picture book by viviankirkfield. Bookmark the permalink. Great review! I like the “Food Mobile”! You’re welcome, you’re welcome. 🙂 Seriously though, Susanna, you first…and then Julie, have been my magical portal to this amazing kidlit community. Thank you for the kind words about the review and the activities…I think you are building an exceptional resource for parents, teachers and librarians. And yes, I am so excited about the critique groups…and am grateful to Heather for her beautiful review of Show Me How! This sounds so sweet, Vivian! My girl just started preschool so this would be a great one to read with her. She’s brimming with excitement, though, not a reluctant school-goer, but I still think she’d enjoy it. And it reminds me that I should get out the Kissing Hand which we have around somewhere. What a precious cover. I will share this with young moms and a couple of friends who could use it for their classrooms! I LOVE this book and its message! It has an otter. I’m hooked. What a sweet story and the mobile looks such fun to make. Oh Joanna…are you an otter-aficianado? Glad you liked the story…Digby is adorable. 🙂 Mobiles are so much fun to make…and REALLY easy…great craft for kids of all ages! Heather did a fabulous job on the review for your book. You are very fortunate to be surrounded by so many lovely followers. Grin. Great message for kids in this book. Starting school can be scary and so I like that it speaks to the reluctant child. Kisses in his pocket – great idea. Like the moblile activity. Wonderful post, Vivian. Lovely activity, book, and lunch ideas. What a sweet idea. I think Cooper and I could use the idea of a pocket full of kisses. Oh Wow!, How come I missed this post?… This is the most sweetest story and I just love that cover. How cute to have kisses in your pocket to help you get through the day and I love how he used them to help someone else. I am so delighted that a talent such as yourself has joined our critique group. In taking this big step I am looking forward to learning much from the group. Thankyou Vivian and I would love to read your book and give a review, sometime. PS. Thanks for including a link to my recommendation of Colors of Me. Hi Nessa…thanks so much for stopping by. 🙂 Yes, my oldest was a really “picky” eater. And so was I as a young child. 🙂 Glad I uncovered a forgotten treasure for you…another lovely craft project is to make “hug and kiss” coupon books…the child can decorate each coupon…staple them in a book…and then he/she can pull out one coupon and give it to mom or dad whenever there is a need for a special hug or kiss…and what a great opportunity for the parent to cuddle and talk about anything that might be bothering the child. Another great post. I hope the exchange went well and the in-person group is fun. I hate to miss it this month. Hope to see you at next month’s meeting….which is Thursday, Oct.18…and the local SCBWI meeting is scheduled for Sunday, Oct 21…both meetings are at the East Library. It is a lovely story…and helps kids realize how important it is to reach out to others. 😉 Thanks so much for stopping by!